There’s a new face greeting visitors at the Ottawa County Courthouse. The first robot court greeter in the country is being tested this week only at the Grand Haven courthouse. And, although temporary, CORA (court-operated robotic assistant) could be the face of the future in courthouses across America. CORA is also named for Ottawa County’s first female Probate Court judge, Cora VandeWater, who served the county from Jan. 1, 1933, to Dec. 31, 1948. The robot’s name was the result of a courthouse employee vote. CORA is a pilot project, allowing court officials and its manufacturer, Advanced Robot Solutions, to get input on what programs should be included in the robot. For now, CORA is directing visitors around the courthouse. Through a large touchscreen, it can be searched for court dockets, frequently asked questions, and information about the judges and referees in both English and Spanish. An entertainment component will give it some dancing moves and a camera that will allow you to put your picture in her face. Advanced Robot Solutions has some similar life-size units in the San Jose, California, airport, as well as at some hospitals. 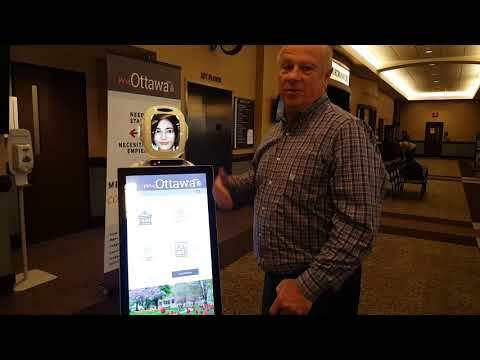 At the airport, the robots help people find gates, said company owner Paul McManus. The robots are popular at trade shows, as well, he said. McManus said he was contacted by Ottawa County Circuit Court Administrator Kevin Bowling, who is on the board of the National Center for State Courts, based in Virginia. McManus said that once this first phase of testing is completed, Bowling will discuss it as the keynote address at the E-Courts Conference in Las Vegas in December. The robot will be back in the Ottawa County Courthouse in January for a second phase of testing and feedback, McManus said. The robot was introduced to visitors in the courthouse on Tuesday. “We got some feedback and made some tweaks,” McManus said. The robot will be in the courthouse through Friday. Ottawa County Circuit Court Trial Division Director Susan Franklin said they are hopeful that the robot works out for the courts. Franklin said the entertainment aspects of the robot could also be used to alleviate stress at the juvenile court. McManus said Ottawa County has not purchased a robot at this time. If the county chooses to go ahead with it, it would lease the robot with a service plan at about $2,800 a month, he said. Security Deputy Adam Brown said it’s been interesting watching people interact with the robot.